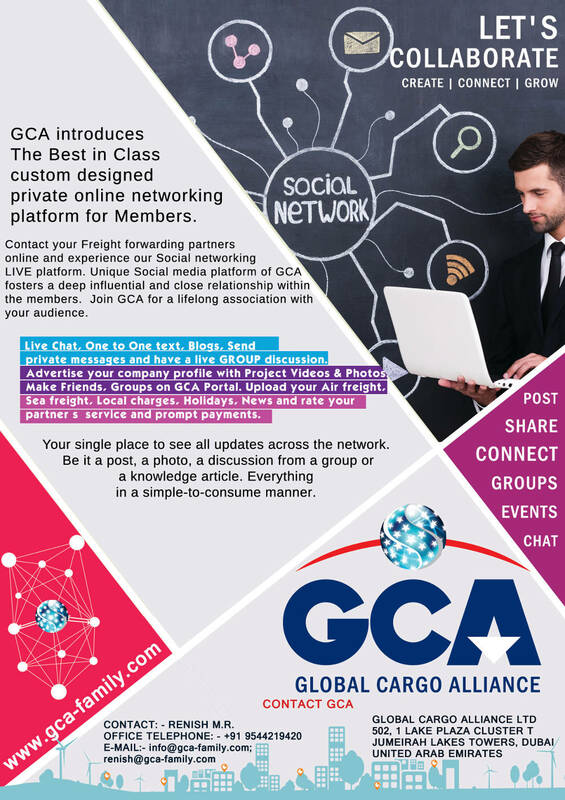 Welcome to GCA live portal and experience the unique way of networking with a difference. GCA Network has designed a software solution that as a member, you will have access to it in order to grow your business within the network. GCA Networking Platform will be a fully live portal and will have various functions like live chat, blogs, one to one text, discussion forums, private messages, uploading member’s project photos, uploading Rates, Rating based on members service and prompt payments, members can upload holidays, Industry news etc by themselves. Contact your Freight forwarding partners online and experience our Social networking LIVE platform. Advertise your company profile with Project Videos and Photos. Live Chat, One to One text, Blogs, Send private messages and have a live GROUP discussion. Make Friends, Groups on GCA Portal. Upload your Air freight, Sea freight, Local charges, Holidays, News and rate your partner’s service and prompt payments. Your single place to see all updates across the network. Be it a post, a photo, a discussion from a group or a knowledge article. Everything in a simple-to-consume manner. Experience the only Network with more benefits and Rewards offered to Members each business, Payment protection and maintaining close relationships between members.